Snowy was found by Fred’s grandson and donated to Fred, who in turn donated him to me. I know his name was to be Sandy as suggested by Fred’s great grandson, but it was advised that the name be Snowy due to his white coat. Snowy I discovered to be deaf. 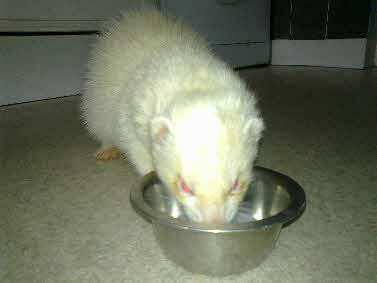 Snowy is now vasectomised and used for the purpose of putting jill ferrets out of season with out litters being born or the need for medical or surgical work. I have 4 intact Jills’ so he has been busy this year (2014). During January 2015, Snowy was in the kitchen for his exercise while his cage was cleaned. I suddenly noticed he seemed subdued, I thought for a moment he was choking on food, I contacted a 24 hr veterinarian, but while doing so Snowy died in my arms. It is speculated that Snowy died from a heart condition, it was noted he had a oversized abdomen, known to be a sign of heart failure.